Does it sometimes feel like you are doing everything right and yet you have that extra body fat that you still cannot get rid off? Does it drive you insane too? When it comes to reaching our goals and becoming leaner and fitter, what we eat and how we exercise is just the beginning. There is so much more that needs to be addressed and one of the biggest roles to deal with is or HORMONES! Let’s talk about hormones, my friend. We have so many different hormones and if any of these become out of balance; our bodies can start to store extra fat. Due to our stressful lifestyles (and who doesn’t have one, right? ), going on crash diets and exposing ourselves to toxic chemicals on a daily basis is a one way highway to hormone hell! If you have ever suffered from weight issues, you can pretty much count on the fact that you have (or have had) and insulin imbalance. Well, what exactly does this mean, right? Insulin is a hormone that tells our bodies how to store energy…and if this is out of whack (like I said, who isn’t? )..the body will store energy as FAT. Estrogen is another hormone that is commonly responsible in weight gain, storing fat and cellulite. Too much of this is really not a good thing at all. HELP! Want to know how to get a handle on it now? – Avoid plastic that contains the chemical BPA. This has been linked to increasing levels of estrogen in the human body. If you do eat or drink from plastic, make sure its BPA free. – Avoid MSG at all costs!!!! Now here’s the biggie…cortisol is the hormone that your body produces when it feels like it’s under attack. Boy, do I know about this one!! In the caveman era, they required cortisol to help survive in the many dangerous situations that surrounded them daily. The problem with our current day and age is that everything that stresses us out is creating more of this hormone. It raises the levels within our bodies way beyond what we can handle. What happens when this results? Well, elevated cortisol levels increase our sugar and carb cravings (sound familiar?) which then leads to overeating and increased hunger…and this results in our bodies storing more fat. Increased cortisol levels actually break down our muscles, which will then slow down our metabolism. (and this is bad news) HELP ME!! What can we do about this today? Hormones are nothing to ignore. Dieting only creates more imbalance so the best suggestion I can give you today is to stop dieting!!!!! Eat clean and wholesome nutritious foods. Work on regaining balance to your body and supplementing with dense nutrition, such as Shakeology. Start going to bed at a decent hour and getting your body on track to creating healthy sleep patterns. Do more of what brings you peace and joy and limit stress as much as you can. Reach out to others for support and don’t accept anything less. Need more help? 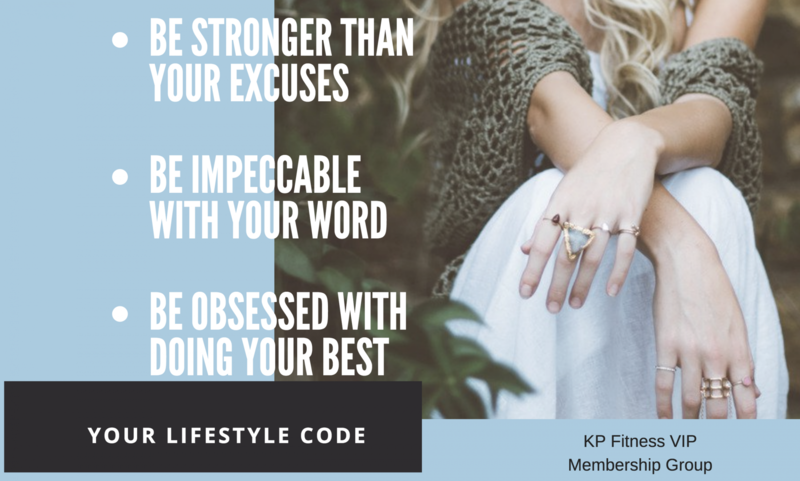 Send me an email and we could match you up with our next support system to help you succeed today. It’s up to you to take that first step. Will you? Are you prone to food cravings, binges and eating your way through emotional stresses? I have always felt as if there was no hope for me when my body went into “binge mode”. I tried everything and anything that I could find to offset these binges. I tried willpower; I used foods that wouldn’t hurt my goals, such as vegetables and fruits; I drank water, tea and coffee; I would walk away from the kitchen; I would research the reasons why this was happening and never really found the solution that worked. It’s important to first understand the difference between compulsive overeating and other eating disorders. Compulsive overeaters don’t attempt to make up or “punish” themselves for their bingeing with actions such as purging, fasting, diet pills or laxatives. 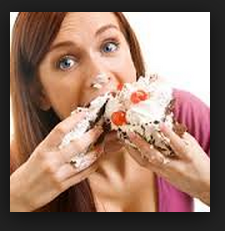 Compulsive overeating typically leads to weight gain and obesity. Keep in mind that not everyone who is obese is also a compulsive overeater. People who appear to be of normal or average weight can also be affected by these behaviors. This included ME! I found it quite upsetting when others would downplay the fact that I was working on finding a solution to this issue; since being just 30 lbs or so above my “ideal weight” wasn’t proof enough to anyone that I was actually dealing with this. 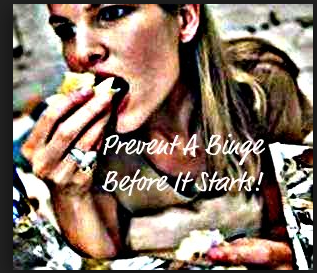 Let’s begin with a few tips on how to prevent a binge; or emotional attack before it hits. Avoid temptation. You’re much more likely to overeat if you have junk food, desserts and unhealthy snacks in the house. (pretty shocking, right? lol) But many of us tend to use excuses as to why we “need” these foods in the home. I used to use my family as an excuse; “they NEED these items. I don’t want them to suffer because of my issues”, etc. But why on earth should they even be eating unhealthy items either? Just because they didn’t go into full-force binge mode at any given moment, didn’t mean that they required junk foods on a regular basis. No, this was my sad attempt to keep these comfort foods close at hand because I felt uneasy to put an end to the episodes. To keep temptation at bay, don’t keep the food within easy access. The best way to do that is not to purchase unhealthy food in the first place. duh dot com. Stop “dieting”. Having a “diet” mentality or severely restricting your food intake can increase hunger and feelings of deprivation. I know that the fact that I would cut out food groups, or meals in general, kept my body in the “all or nothing” phase and thus, would lead to another binge-fest because my body simply needed and craved more calories. Instead of being ultra strict with your food, focus on eating in moderation. Find nutritious foods that you enjoy . Try to eat more small meals throughout the day as well to keep hunger at bay. And the more dense nutrition you put into your body on a daily basis, the LESS it craves anything that isn’t on your meal plan. Check out Shakeology for this fact alone. Start Exercising. Exercise is a natural way to boost your mood and can help put a stop to emotional eating. Not only does exercise help you lose weight and improve your health… it can also help reduce depression and reduce stress. It’s our HAPPY pill, in simpler terms, with no dangerous side effects! Decrease stress. Learn how to cope with stress in other ways that don’t involve food. This one is a doozy but such an important tip to take seriously. 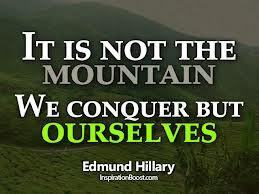 I know, easier said than done… but keep in mind, compulsive overeating has little to do with hunger. People often eat when they are not hungry or use food to fill an emotional need that they cannot cope with in other ways. So the next time you find yourself standing in front of the open refrigerator or pantry and staring into the abyss of foods thinking, I’m hungry for something; shut the door and go sit down to figure out what you are really hungry for. Love? Attention? Friendship? Relaxation? A hug? Whatever it is, it has nothing to do with food. If you don’t know what you want to eat, it usually leads to an emotional need or some help in releasing a stressful time.